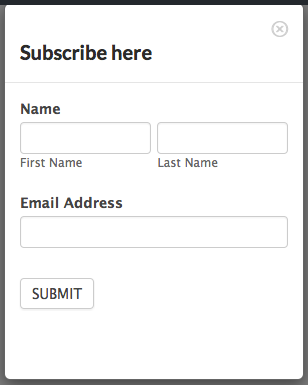 Use the Bootstrap Modal form plugin to open a Formidable form or View in a Bootstrap modal popup. You can also display any shortcode inside of a Bootstrap Modal popup, whether created by Formidable Forms or another plugin. In your WordPress admin, go to 'Formidable' → 'Add-Ons' and click the 'Install' button for the Bootstrap Modal form plugin. 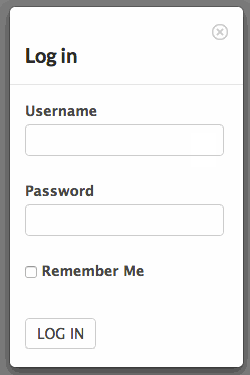 If you would like to show a Bootstrap modal form, follow the directions below. Start by creating a form if you have not done so already. Go into your form's Settings and select Submit with ajax. Replace x with the form ID/Key. You may add any of the regular form shortcode parameters to the formidable shortcode. Publish or update the page/post. Now when the page/post is visited, you will be able to click a link and the form will appear in a Bootstrap Modal popup. If you would like to open a View in a Bootstrap modal, follow the directions below. Create a View if you have not done so already. Replace x with the View ID/key. You may also add any of the regular View shortcode parameters to the display-frm-data shortcode. Now when the page/post is visited, you will be able to click a link and the View will appear in a Bootstrap Modal popup. If you would like to display a login form in a pop-up, follow the instructions below. Please note: In order for this shortcode to work, you must have the Registration add-on installed. Go into edit an existing WordPress page or create a new page. Insert the login form shortocode on the page. Any of the regular login shortcode parameters can be used in the frm-login shortcode. Publish or update the page. Now when the page/post is visited, you will be able to click a link and the login form will appear in a Bootstrap Modal popup. If you would like to display a value from a field in a pop-up, follow the instructions below. Replace 'x' with the field ID you would like to pull the value from. Please note that it will display the most recent entry unless you specify the entry ID with the entry parameter. Any of the regular shortcode parameters can be used in the frm-field-value shortcode. Now when the page/post is visited, you will be able to click a link and the value from the field will appear in a Bootstrap Modal popup. Show a thumbnail image that opens the full sized version in a Bootstrap modal. If the file is is a single file upload field, this can be done dynamically. Replace 25 with the id of the file upload field. 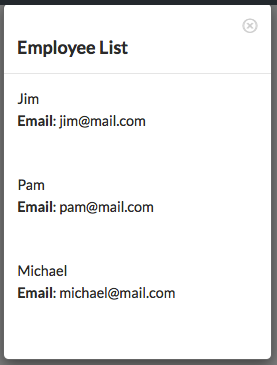 You may insert the frmmodal shortcode on any page, post, widget, View, or even inside of a form. The shortcode inserts a link that will open a Bootstrap modal when clicked. Replace "Put content here" with any content you would like. Shortcodes can be entered as well. The following parameters can be used with the frmmodal-content shortcode. modal_title - Set a title for the pop-up. modal_class - Add a class on the pop-up. class - Apply a CSS class to the clickable link. size - Change the size of the pop-up box. Options are 'large' or 'small'. You may have a theme or other plugins that also load Bootstrap. Sometimes, this can cause the modal to immediately close when clicked. In order to prevent this, the script can only be included once on the page. You can learn more about where to put the code in our documentation.